Adolf Hitler and his Nazi Germany had their dreams of "Drang Nach Osten," a German push to conquer the lands to the East Poland, the Baltic nations, Russia, Belarus, and Ukraine to acquire space for German colonists ("Lebensraum") while enslaving or committing genocide on the Slavic peoples. 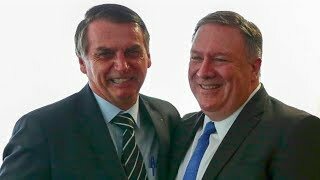 In a recent joint White House appearance with Brazil's neo-Nazi president, Jair Bolsonaro, Donald Trump expressed a desire for Brazil, a South Atlantic nation, to join the North Atlantic Treaty Organization, NATO. 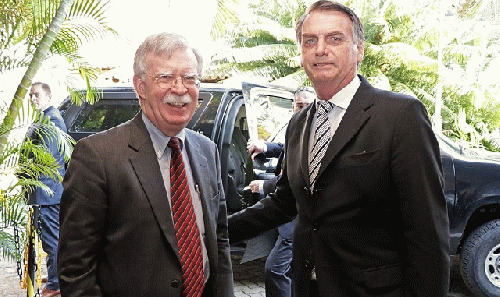 Trump, appearing at the White House alongside Brazil's far-right and Hitler-admiring president, Jair Bolsonaro, said, "I also intend to designate Brazil as a major non-NATO ally, or even possiblyif you start thinking about it maybe a NATO ally. I have to talk to a lot of people, but maybe a NATO ally." Article 10 of NATO's 1949 founding charter clearly states that only European countries, the US, and Canada can join the military pact. Article 10 states: "The Parties may, by unanimous agreement, invite any other European State in a position to further the principles of this Treaty and to contribute to the security of the North Atlantic area to accede to this Treaty. Any State so invited may become a Party to the Treaty by depositing its instrument of accession with the Government of the United States of America. The Government of the United States of America will inform each of the Parties of the deposit of each such instrument of accession." Many diplomatic observers scoffed at Trump for his seeming ignorance of the fundamental nature of NATO, however, expansion of NATO in various forms has long been the desire of neo-conservatives and US warmongers going back to President Richard Nixon's Secretary of State and National Security Adviser, Henry Kissinger. During the George W. Bush administration, neocons pushed for a change in the NATO charter to allow for Australia, New Zealand, and Japan to join the NATO alliance, which would adopt another name. During the height of the Cold War, there was no desire to expand NATO beyond Europe and North America, because Dwight Eisenhower's Secretary of State, John Foster Dulles, had created a network of military alliances in other regions of the world to serve, like NATO, as collective defense instruments. These included the Southeast Asia Treaty Organization (SEATO), or Manila Pact, created in 1955. Oddly, SEATO's only Southeast Asian members were the Philippines and Thailand. All of SEATO's other members were located outside of Southeast Asia and were only included in the alliance as a means to extend collective security defense to their colonial; possessions and holdings in the region. These members included Australia, which ruled over Papua New Guinea; France, which was relinquishing its colonial hold over Vietnam, Cambodia, and Laos; New Zealand, which had a defense presence in Singapore; Pakistan, which ruled over East Pakistan, now Bangladesh; and the United Kingdom, which ruled over colonies in Hong Kong, North Borneo, and Sarawak and maintained a protectorate over Brunei. SEATO was dissolved in 1977. Another US-led Cold War military pact was the Central Treaty Organization (CENTO), also known as the Baghdad Pact, created, like SEATO, in 1955. Ironically, the United States ever became a full member of CENTO. Included as founding CENTO members were Iraq, Iran, Pakistan, Turkey (also a NATO member), and the United Kingdom. It is said that the pro-Israel Lobby in the United States strongly objected to the United States joining CENTO because of the possibility that American troops might have been forced to go to war against Israel in the event of a conflict involving the Israelis and Iraq. In 1959, Iraq withdrew from CENTO and the alliance dissolved in 1979, following the Islamic revolution in Iran. In 1947, the US extended collective security guarantees to the Western Hemisphere through the Inter-American Treaty of Reciprocal Assistance, or Rio Treaty. It has become a rather moribund alliance since the withdrawal of Cuba, Venezuela, Bolivia, Mexico, Nicaragua, and Ecuador all nations opposed to US hegemonic control over Latin America. After the September 11, 2001 attack on the United States, leading neocons in the Bush administration, including those pushing for a US-led alternative to the United Nations, namely Bush's ambassador to the UN, John Bolton now Trump's National Security Adviser and National Security Council adviser Elliott Abrams now Trump's Venezuela "regime change" envoy argued for a new global military alliance. Many neocons wanted to make permanent the "Coalition of the Willing" the United States cobbled together, with the help of NATO's Article 5 collective defense clause, to join American-led wars in Iraq and Afghanistan. In the 1970s, with SEATO and CENTO all but pages in history, Kissinger saw an opportunity to expand America's military presence southward. Pleased with the success of Operation Condor, an intelligence alliance of Latin American military dictatorships that targeted for assassination and apprehension leftist leaders and students in South America and beyond, Kissinger saw a military alliance of the Condor partners of Argentina, Brazil, Chile, and Uruguay, along with apartheid South Africa and the United States, as firmly extending US military control over the south Atlantic region. Trump's "Drang nach Suden," or "push to the South," has some historical underpinnings. Central Intelligence Agency declassified files from 1976 describe Argentina and Brazil holding discussions on creating a SATO to counter the "Soviet-Cuban presence in southern Africa." Initial plans for SATO would see the pact as mainly a naval alliance. These talks obviously had the blessing of then-Secretary of State Kissinger. In 1980, CIA files indicate that the United States had pressured Barbados and Trinidad and Tobago to form a joint military force as a predicate to joining a wider military alliance of South Atlantic nations. That same year, Chilean troops were reportedly assisting South African troops in battling independence fighters, backed by Cuba and the Soviet Union, in Southwest Africa, now Namibia. Such Latin American deployments to assist South Africa curbing leftist influence in southern Africa was considered one of the benefits of SATO. Franklin Krammer, who later served as Assistant Secretary of Defense for International Security Affairs in the Clinton administration, stated in 1980, while serving as a Pentagon official, "within the framework of US military and economic aid to Latin America and the Caribbean countries, resources aimed at helping create SATO are being especially considered." Kissinger's plan for SATO continued under Ronald Reagan, an administration that was jam-packed with neocons who had left the Democratic Party to flex their muscles in Reagan's National Security Council and Defense Department. White papers on SATO began appearing in the bowels of Reagan's military-intelligence complex. One 1982 US Army paper recommending the establishment of SATO cited the perceived threat: "The South Atlantic has become an area of intense East-West confrontation and in recent years it has witnessed a large Soviet influence particularly on the west coast of Africa, giving the USSR the capability to disrupt the vital shipping lanes in the area." In 1981, retired General Vernon Walters, a Kissinger prote'ge' and former deputy director of the CIA, arranged a conference in Buenos Aires sponsored by several CIA think tanks on the concept of SATO. Military representatives from the United States, Argentina, Brazil, South Africa, Paraguay, and Uruguay attended the confab. In 1984, there were discussions between the Reagan administration and Brazilian President João Figueiredo, Brazil's last military dictator and a participant in Condor as the head of the Brazilian National Intelligence Service (SNI), to form a SATO. However, the Falklands War between the United Kingdom and Argentina, which saw many prospective SATO members taking up opposing sides, all but killed off the SATO proposal. On his first visit to the U.S., President of Brazil Jair Bolsonaro eagerly receives his instructions from the CIA and Trump's foreign policy team.